alking in Languedoc focuses on the abundance of remarkable hiking, trekking and walking trails in the Languedoc-Roussillon region. If you are looking for ideas for future walking trips in France, but haven’t made your mind up regarding the region, you really need look no further than hiking in Languedoc. It is blessed with some of the best and most varied hiking in France, and many trails that can be walked all year round. Walking in Languedoc can be very similar to walking in Provence in places, particularly where they converge – and just where one ends and the other begins is, of course, a stong bone for contention. Historically speaking, those living to the east of the Cevennes foothills have always considered themselves to be part of western Provence. They tend to ignore central government-imposed regional boundaries that push Nimes and Uzes into Languedoc, when most [including the Michelin guide] naturally place them within Roman Provence or Provence Gard. While this trail starts to the north of Languedoc, the bulk of the trip takes place within the Languedoc region. It is a top-ten ranked trail that takes you from Le Monastier, near Puy-en-Velay in Haute Loire, to St Jean-du-Gard in The Cevennes, a distance of 156 miles or 252 kilometres. Travels with a Donkey in the Cévennes, first published in 1879, was one of Robert Louis Stevenson’s earliest works. Admired by the likes of John Steinbeck, it is considered a pioneering classic of outdoor literature and one that set the standard for the whole travelogue genre that was to follow by presenting hiking and camping outdoors as a recreational activity. Futhermore, Stevenson’s walking in France can be considered as a catalyst for the whole back to nature and modern hiking sports and social genre. The Book relates Stevenson’s twelve-day, solo hiking trip through the thinly populated and impoverished areas of south central France and into the Cévennes. He spent a few months planning it from Le Monastier before he departed and, whilst twelve days is perhaps the optimum period for accomplishing this delightful walking holiday in France, the minimum time required is nine. Stevenson was bedeviled with poor health for much of his life and some argue that this trek hastened his departure from the world; not due to the level of difficulty of the trail itself, but because he developed a penchant for sleeping out rough at night that few others would undertake nowadays. Thankfully the quality of accommodation that can be found along the entire length of the modern Stevenson Trail obviates the necessity to have recourse to a tent. Stevenson was in his late twenties when he undertook this long-distance trek and the route he took was not of any particular significance prior to his visit. His objectives were simply to visit some of the places in The Cevennes that had become household names during the Uprising of 1702 and, along the way, try to forget his American ‘lost love’. Walking Languedoc’s GR70, as it is known nowadays, is done purely for recreational purposes, and in relative comfort, from April to October respectively. For those who enjoy classic inn-to-inn hiking, it is a must. If you would like to read the book on-line, click here. Walking in Languedoc on long distance pathways can obviously take you across departments, but also lead you into other regions and even across national boundaries. The Celts preceded the Romans in Languedoc-Roussillon. Having arrived from Northern Europe, they settled and rarely travelled, and brought in their provisions by sea. In contrast, for reasons of Empire construction and maintenance, The Romans were much travelled and constructed fine and straight roads or ‘vias’. 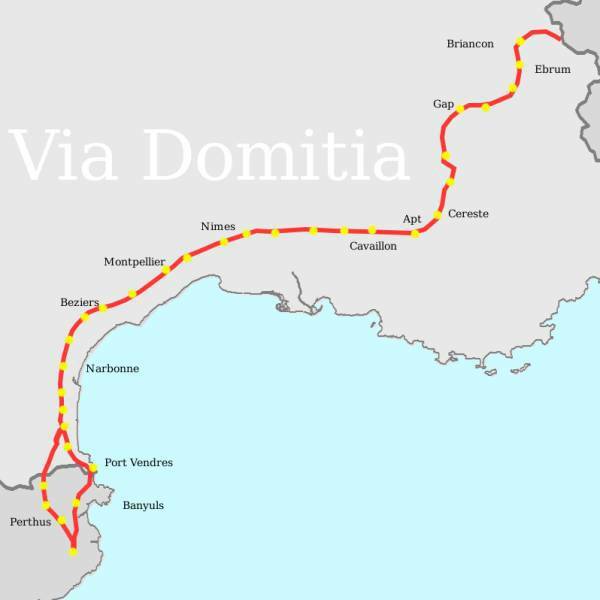 The most important of such roads in France, The Via Domitia, joined Rome with Spain and traversed the south coastal strip of France, through Provence and into Languedoc, along what is now called ‘La Languedocienne.’ It was constructed by Emperor Dominus Eanobarbus in 118 BC. A good part of the route still remains as it traverses The Region from Beaucaire in The Gard to Spain. Those interested in walking sections of it as part of a walking Languedoc tour should contact us for further details. For example, our Hiking Camargue tour follows the route on its second day. Once it reaches the Pyrénées, it splits into two paths: the Eastern Route follows the coast down to Portus Vénéris (Port-Vendres) whilst the alternative path goes via Perthus Pass in French Catalonia, crossing Cerdagne by la Via Confluentana. Most of this is now covered by the RN116. Throughout the route, The Romans placed monoliths of around 2 metres in height called ‘borne Milliaires’ at a distance of one mile from each other. They were engraved with the name of The Roman Emperor. The first of these monoliths can be found 2 kms west of Beaucaire. The UK has of course kept faith with such an ancient measurement. Just like today, there were locations en route that served as staging posts and watering holes. Perhaps the most noteworthy along the route is the town of Salses. The surface of the Via Domitia was not paved or cobbled, except for the parts inside towns or at major crossroads. Those walking in Languedoc will be interested to learn about France’s most influential trail, forgotten in the modern era but recently reborn. The Régordane is the cultural jewel in the Languedoc hiking crown – a path that awaits its placement in the Pantheon of French walking tours. The Régordane’s history goes back to classical antiquity, but its origins are thought not to be Romanesque, but Gaulist. It is the southern section of the route that links Paris to Nimes and beyond, and the part referred to as Le Chemin de Régordane is strictly speaking the section linking Luc in the department of Lozere to Alès in Le Gard. Régordane saw its halcyon days from the twelfth century onwards, when goods travelled along its course from the Mediterranean ports like Montpellier, Aigue-Mortes and Saint-Gilles to Parisian tables. An important pilgrimage route, linking to the Chemin de Saint Jacques (see below), its upkeep suffered with the lack of Church funds following the Albigensian Crusade. 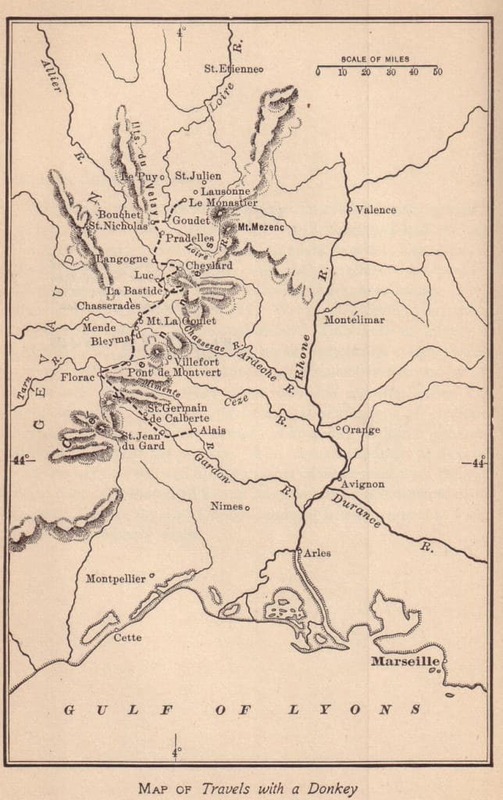 When Gaul spread eastwards, The Rhone Valley took precedence and, whilst it had something of a second wind at the time of the industrial revolution, it was short lived once railroads became the preferred means of shifting bulk resources. The route shares the same natural fault-line as the more recent Chemin de Fer, whilst a good deal of the original trail has been tarmacked. Nevertheless, the modern variant rarely follows the main road, but instead relies on a mix of countryside trail and single-track road. All those walking Languedoc should actively support this gem of French heritage, the preservation of which remains a future battlefield. The Régordane offers various options for hiking depending upon your interests. You can hike the extended Le Puy – St Gilles trail (the St Giles Way) comfortably in two weeks; while the shorter ‘Regordane’ will take you about half the time. For those who enjoy historical ramblings through myriad villages and character hamlets, The Régordane is hard to beat. The Best of the Regordane Way. 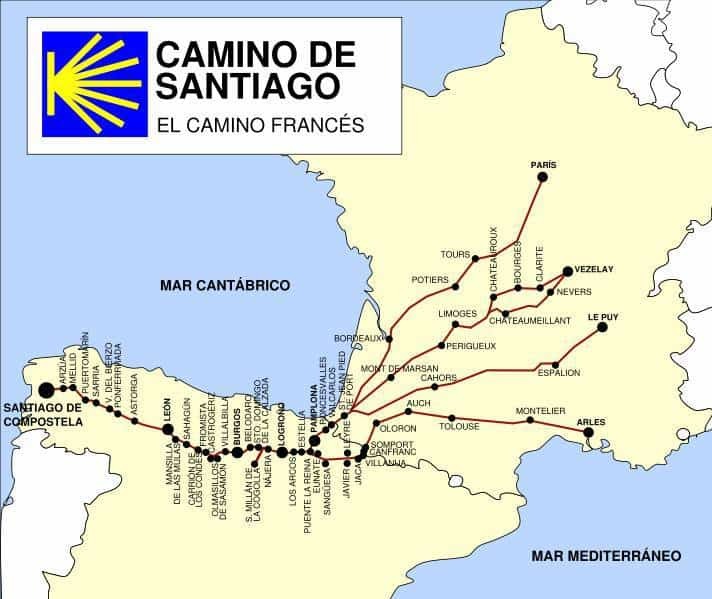 The French ‘Ways of St James’ (Spanish: Camino Francés) are the most popular routes of the pilgrimage to Santiago de Compostela in Spain. Besides the most important variant, the Via Podiensis or Le Puy Route, sections of which have been ranked for some time in the top ten of walking tours in France, the Languedoc or Arles route originates in Provence. 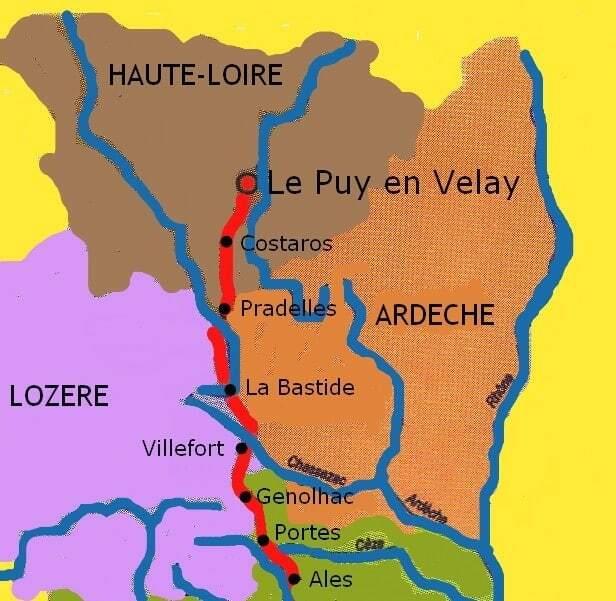 It is an extension of the route from Italy, the Via Tolosana, and becomes the Arles Way or La voie d’Arles (Chemin d’Arles) in southern France. After Arles, it passes through Montpellier, Toulouse and Oloron-Sainte-Marie before reaching the Spanish border at Col du Somport in the high Pyrenees. There it connects to the Aragonese Way. Walking Holidays in France Ltd.